“Can you hear us now?” gave way to “We love Colgate — go, ’Gate, no hate!” as about 400 students, professors, and staff members marched together from the Hurwitz Admission Center at J.B. Colgate Hall to Memorial Chapel. As recently as that previous weekend, a community member had witnessed Colgate students yelling racial and homophobic slurs, but at the demonstration many students began sharing their stories of having endured incidents of racism, classism, homophobia, and sexism on campus. President Jeffrey Herbst — along with Suzy Nelson, dean of the college, and Douglas Hicks, provost and dean of the faculty — joined the sit-in for several hours that Monday to listen. Throughout the week, Herbst, Nelson, and Hicks spent many hours with ACC representatives, working together to create a plan for change. 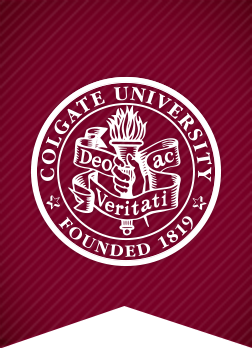 By noontime Friday, the plan was revealed on Colgate For All, a new website outlining a 21-point road map that will be updated and followed closely for months and years to come. Photo at top by Andrew Daddio. See more photos and follow updates. 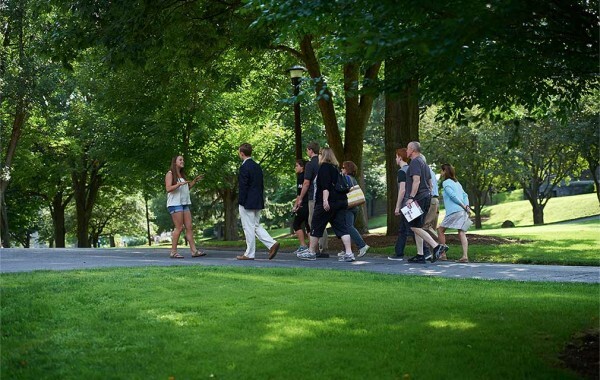 Taking a tour is one of the best ways for prospective students to get a feel for the campus and the Colgate experience. It’s also a bit of a hike. As an admission tour guide and summer intern, Katie Williams ’15, a geography and history double major, decided there had to be a better way for tour groups to tackle the legendary hillside. So, she turned her question into a research project for her Geographic Information Systems (GIS) course with Professor Peter Scull. Williams married existing campus slope data with the campus map and the old tour route. She then mapped the routes with GIS software and analyzed the data. Unlike most GIS data crunching, Williams also had to factor in qualitative items, such as required tour stops, and make sure visitors have a chance to take in some of the best views of the Chenango Valley. 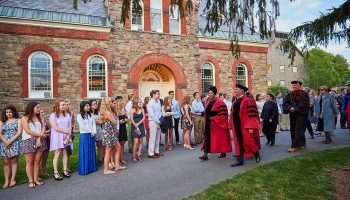 She found that the existing tour hit two areas of steep incline that could be avoided — so she developed a new route that ignores a traditional turn at the chapel and marches directly toward Frank Dining Hall. Following the stop at Frank, her groups visit a first-year residence hall and then move onward to the Coop, followed by the Ho Science Center. Almost all of the climb is tackled gradually at the start, and then it’s a gentle downhill journey. Some students adjust to college easily, while others struggle and even falter. A new online non-credit “course” — 13 short videos made by Colgate professors — is designed to minimize the mystery about what it takes to succeed. The series also includes student-produced video responses featuring current students and alumni. 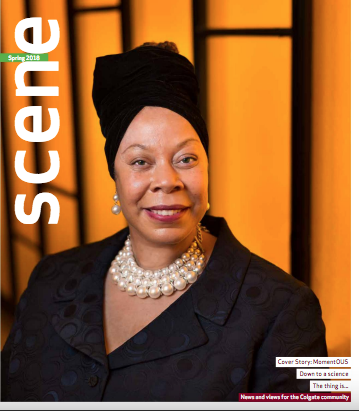 “We believe that the students who succeed academically and socially right away are the ones who take their college experience into their own hands,” said Spencer Kelly, a psychology professor, “so our goal is to teach students how to do that from the start.” Kelly appears in The ’Gate Way series with Douglas Johnson, who also teaches psychology, and Yukari Hirata, who teaches Japanese. All three study the science of knowledge acquisition, which is what drew them to this digital collaboration. The videos cover keys to student success such as sleep and time-management strategies, keeping an open mind, getting to know professors, and knowing when to ask for help. 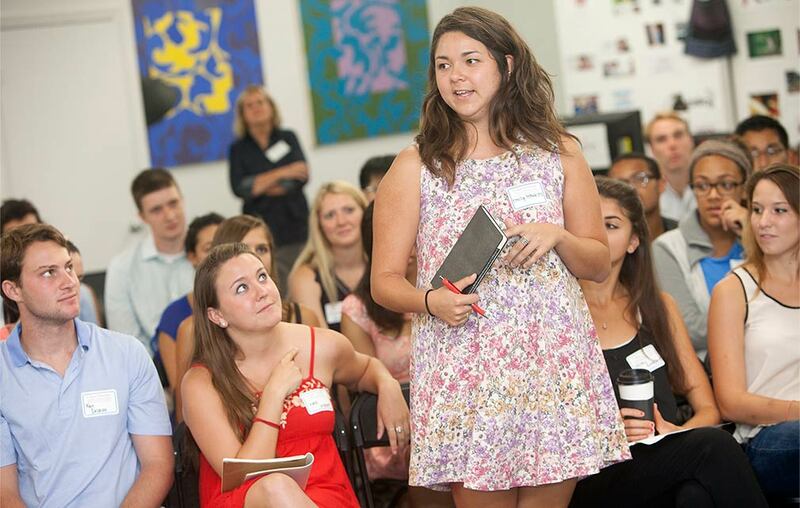 Alexandra Caudill ’13 worked on The ’Gate Way series for nearly a year as a Living the Liberal Arts Fellow. In addition to helping with scripting and scheduling, she organized dozens of students to record their responses to the various lessons, and produced a teaser video designed to attract first-year viewers to the series. Electric vehicle drivers can now power up on Lally Lane. In 2011, Chris Paine ’83 directed the film Revenge of the Electric Car, chronicling the resurgence of electric vehicles (EVs) following their failure to go mainstream early in the century. 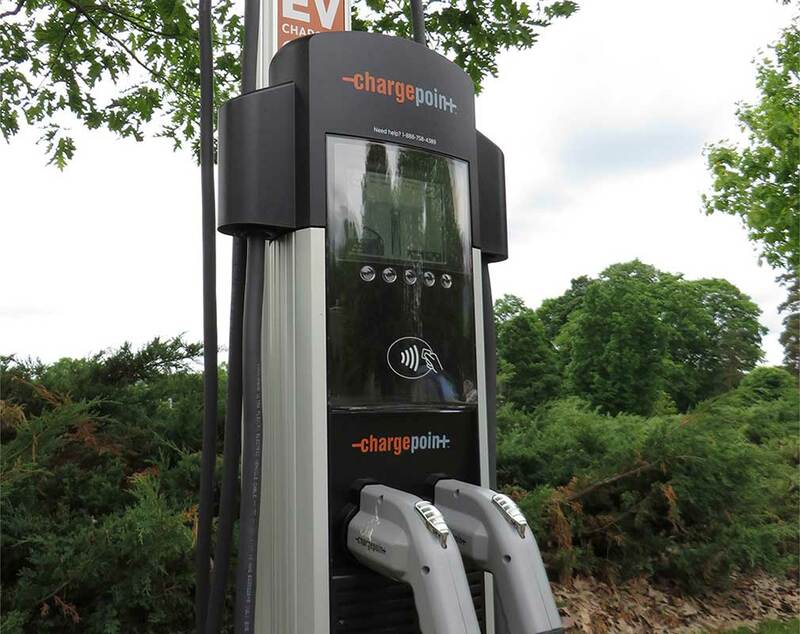 In recognition of the EV’s “revenge,” Colgate unveiled its first on-campus charging station, instantly making environmentally sustainable transportation a more viable option on campus. Located on Lally Lane near Donovan’s Pub, the station will allow EV owners to “refuel” at a reasonable rate of $1.50 per hour, with a full charge taking between three to six hours. A Level 2 ChargePoint station, it’s compatible with any EV make and model, although Teslas will require an adapter. The university’s vehicle fleet already includes two fully electric vehicles, and the charging station opens the possibility that more could be added. Given that greater than 10 percent of the university’s carbon footprint results from vehicle emissions, expanding options for electric vehicle usage is a significant step in Colgate’s quest for carbon neutrality by 2019. Incorporating more EVs into the Colgate fleet will also reduce operating costs, because the local cost of electricity is significantly lower than that of gasoline. 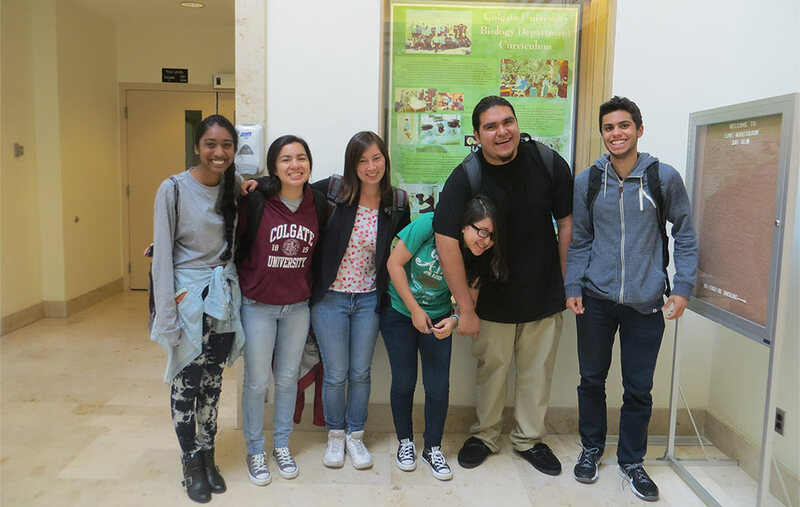 As a residential academic coach, Manny Heredia-Santoyo ’14 (second from right) has been a role model for first-years in the Summer Institute. Staying at Colgate for one last summer after he graduated, Manuel Heredia-Santoyo ’14 wanted to bring to the Summer Institute what he learned through his own experience. For five weeks, he lived, ate, took classes, and shared stories with 13 incoming students. As a residential academic coach (RAC), he was a role model in every sense of the word. Run by the Office of Undergraduate Studies (OUS), the Summer Institute is designed to ease the transition into college and enhance academic preparedness for first-year students. Heredia-Santoyo was joined by five other RACs; each led a group of newcomers. The RACs “are superstar students who use different approaches to be leaders and be involved in the community,” said OUS director Frank Frey. 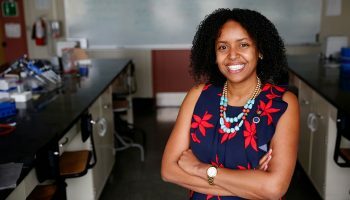 “They show incoming students that there isn’t a singular type to do well in school.” Frey, who’s also a professor of biology and environmental studies, facilitated the Summer Institute with Frank Kuan, senior associate director, and coordinator Fareeza Islam ’14. This year, the institute accepted 39 participants who had taken rigorous courses at their high schools, excelled academically, and demonstrated creativity and intellect. They’ve also shown determination in spite of personal, economic, and social challenges. “With the obstacles that they’ve had to face and the experiences they’ve gone through, a lot of these students have already lived a lifetime,” said Heredia-Santoyo. 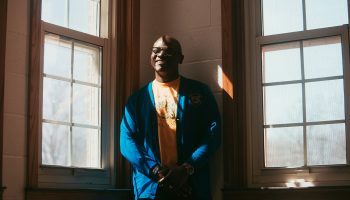 His group took two demanding classes, Literatures of Oppression with Professor Jeffrey Spires and Biology and Human Development with Professor Jason Meyers. The five-week, 200-level classes demand more of the students than courses taken during the school year. The Summer Institute also introduces students early to campus resources including the libraries and career services. “The OUS program provides everything they need to be successful here and have the best experience they possibly can, and the resources that allow them to take advantage of everything Colgate has to offer,” said Heredia-Santoyo. “Our RACs have been helpful in showing us the ropes and teaching us things — like how to deal with stress, to surround yourself with people who care about you, and to do things you enjoy,” said Anika Rutah ’18. Fill a room with teachers, hand them philosophical texts and pose centuries-old questions about the nature of spirituality and religion, and the conversation is bound to get interesting. 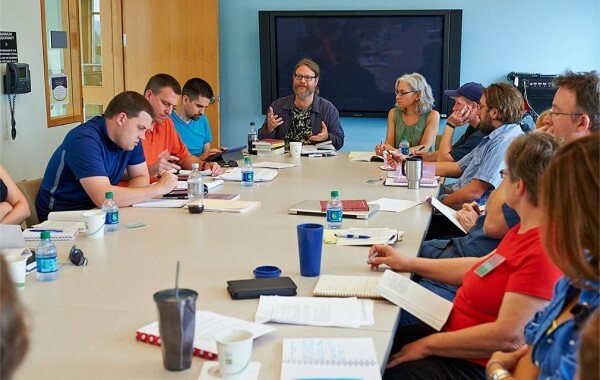 In July, four Colgate professors led a free arts and humanities workshop called “Atheism and Other Theisms” for 13 area high school teachers. In addition to Riley, Naomi Rood (classics), Benjamin Stahlberg (religion), and Edward Witherspoon (philosophy) taught the seminar, which has become more interdisciplinary since John Jacobs (philosophy) first taught it 10 years ago. 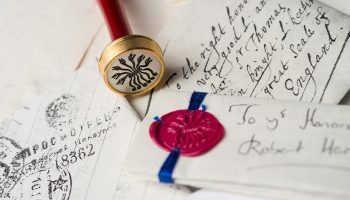 One session, devoted solely to pedagogy, tried to make the link between the seminar itself and the potential application of the information in classes. The initiative builds on the themes of civil rights, justice, and social activism that were prevalent in the first-year summer reading assignment, Freedom Summer by Bruce Watson. The 2010 historical nonfiction novel was chosen to commemorate the 50th anniversary of the summer in Mississippi when college students from across the United States helped Americans to recognize the civil rights offenses occurring in their own country. The film, which chronicles the student effort to register black voters in Mississippi during the summer of 1964, tells the story from the perspective of the people in Mississippi. It begins before the volunteers came to the state to register voters and ends with the 1964 Democratic National Convention. “We used Freedom Summer as a springboard into a yearlong discussion on civil rights,” said Doug Hicks, provost and dean of the faculty. Professors and students representing different academic areas teamed up to organize events, including a brown bag with two professors who themselves participated in the Freedom Summer movement, Jay Mandle (economics) and Joan Mandle (sociology and anthropology, emerita). Upstate New Yorkers flocked to Hamilton to celebrate the Fourth of July. As live music filled the air, people sipped cold lemonade and children donned as much red, white, and blue as they could manage for the parade along Route 12B. The festivities concluded with a skit called “Betsy Ross and the Flag” and a service honoring veterans. Also in July, children with stamped passbooks scoured the town in search of those red and white stripes made famous by a certain tuque-wearing character. Paper Waldos took up residence in 25 village establishments during a month-long quest to Find Waldo in Hamilton. Children with full passbooks earned prizes donated by local businesses and the Colgate bookstore. The nationwide event was sponsored in part by 250 independent bookstores to encourage communities to patronize their local businesses in a fun way. 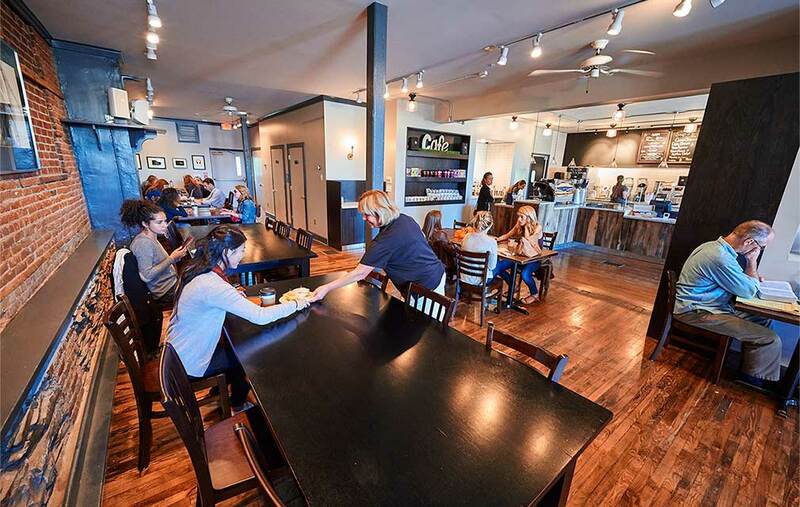 The Barge Canal Coffee Company — a village fixture since 1996 — was renovated over the summer and reopened its doors as Saxby’s at the Barge (pictured). Saxby’s has a presence in eight college towns, but aimed to preserve the Barge’s atmosphere and culture, including creative programming. The newly revitalized café at 37 Lebanon St. features a few beverages especially relevant to Hamilton, such as the Kookie Monster and Snow Peak. Another change to the eatery scene is No. 10 Tavern at the main downtown intersection. The restaurant kicked off its first summer with a Sunday evening live-music series. Folks chowed down on the specialty double decker burgers to the sounds of a washboard, acoustic guitars, a mandolin, and other instruments played by local artists. On campus to mentor those students were Tim O’Neill ’78, managing partner of Golden Seeds Fund 2 LP; John Nozell ’81, the head of school of the Cheshire Academy; Per Sekse ’78, managing partner of alTreo LLC; Andres Echenique ’83, senior partner, digital and media solutions at Eric Mower and Associates; Lynn Plant ’77, principal owner and CEO of BrandCentric LLC; Evan Berman ’10, founder and CEO of Frava; Oak Atkinson ’87, founder and owner of Tumbalina; Patricia Nozell ’81, the executive director for Susan G. Komen for the Cure Twin Tiers Region; Ram Parimi ’05, vice president of sales at Social Tables; Greg Dahlberg ’98, director of marketing at GT Nexus; Scott Annan ’05, president of AIMbitious; and Bruce Rutter ’73, strategist and writer for Foster Design Group. With 10 student teams returning, this year the participants were split into two levels. While the 100-level students brainstormed how to get their ventures off the ground, the 200-level group focused on what they accomplished over the summer and consulted about moving their ventures forward, from establishing goals to planning and development to determining marketing strategies.